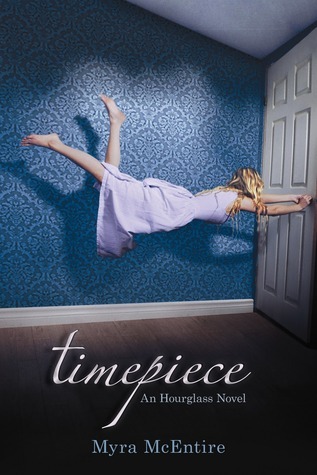 While Timepiece is the sequel to Hourglass, the continuation of the story is told from a totally different POV. It is told from Kaleb's POV, the "bad boy" in Hourglass, all the while still harboring feelings towards Emerson. When I started reading it, I didn't know what I would feel about the 180 degree switch in POV and I really wanted more of Emerson and Michael, but getting to know Kaleb's story and also seeing him slowly get over Emerson and basically find himself again made Timepiece a solid and great follow up to the much loved book1 in this series. We get to find out more about Hourglass, and the time traveling concept and also the seeing people from the past too. At some points I was confused, especially with the switching back and forth and being able to change the past and alter people's lives in seconds, and I was having some doubts on which altered life we are it (I know im confusing you guys!) but I ignored the 100 questions I had and just went along with the characters and their discoveries. I again loved the pacing of Timepiece and there was even a whole romance line for Kaleb which I enjoyed, but not as much as Emerson and Michael. You also get to know more about Emerson's best friend, Lily, but unfortunately Emerson's brother and his wife barely show up in the book and I was a bit disappointed because I am somehow really fond of these secondary characters. As for the villains, they somehow doubled in Timepiece and while I still don't have the whole picture, you do get to see some kick butting of the villains at the end of Timepiece. I really did enjoy reading everything from Kaleb's perspective, and you get to see the real him, the one that somehow feels responsible for all that has happened to his parents and always puts others first instead of him and no matter how cliched it is, I loved how his tough exterior was all just.. an exterior and a wall to protect his feelings and his heart. I was glad he didn't get desperate for Emerson and didn't cling to her but actually moved on and that totally makes me think it was great of Myra McEntire to make the leap of Kaleb from being a secondary character to a full out protagonist. I would recommend this book to the fans who have enjoyed Hourglass, and this full series to all YA readers, because as I mentioned in my review of Hourglass, this series has a bit of everything. I absolutely LOVE that this is from Kaleb's POV. I just cannot wait!!! You have no idea how much more I enjoy a male perspective. So bloody exciting. I thought Hourglass was only ok, and I will read this one eventually, so I hope I enjoy it more than the first. It sounds interesting with the POV switch. Great review! I was excited to read this book, and I was a little surprised to find it written from Kaleb's point-of-view. I found this a little harder to get into as Kaleb wasn't a very sympathetic character to me. Even knowing what he had gone through in the first book, I still found him to be a bit of a jerk in the beginning of this book. Luckily, things improved after a bit. Kaleb really began to grow, and this helped the narrative to be much more entertaining. The increasing action in the plot didn't hurt either. Kaleb's relationships with certain characters were a bit predictable, but I still found myself cheering Kaleb on. I actually went from not liking him at all to finding him rather enjoyable by the end. That's really fun when a book can do that.